In this all-new Futurama extravaganza, mankind stands on the brink of a wondrous new Green Age. But ancient forces of darkness, three years older than time itself, have returned to wreak destruction. Even more shocking: Bender's in love with a married fembot, and Leela's on the run from the law - Zapp Brannigan's law! Fry is the last hope of the universe ... so if you're in the universe, you might want to think about going somewhere else. Could this be the end of the Planet Express crew forever? Say it ain't so, meatbag! Off we go, Into the Wild Green Yonder! 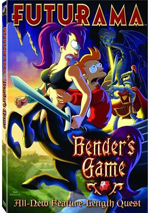 After the cancellation of Futurama in 2003, the show got new life in 2007 as a series of direct-to-video movies. We find the fourth – and final? – one of these with 2009’s Into the Wild Green Yonder. This effort takes us to Mars, where Amy’s (voiced by Lauren Tom) father Leo Wong (Billy West) creates a “New Mars Vegas”. When feminist ecological crusaders protest the environmental impact, Leo blows them up and one lands on Fry (West). When her jewelry imbeds itself in his brain, he develops the ability to read minds. Obsessed with bigger developments, Leo decides to build a miniature golf course that will occupy 12 percent of the galaxy. Leela (Katey Sagal) joins the eco-feminists to protest but she ends up in trouble when her group inadvertently kills the headless body of Spiro Agnew. Rather than submit to punishment, they go on the road and launch acts of eco-terrorism. While Leela heads off to halt Leo’s environmental damage, Fry finds himself among a secret society of others with the same mind-reading skills. This sends him on a journey that will inevitably intersect with Leela’s path. In addition, President Nixon (West) hires Bender to stop the eco-feminists and well follow the manner in which all these elements will connect. When I watched the first three Futurama movies, I enjoyed them… to a degree. While each one offered some amusement, none of them truly satisfied. I thought they tended to try too hard and they just didn’t deliver laughs consistently with the TV series best work. Finally, we get a Futurama movie that lives up to expectations and really delivers the goods. I figured I was in for something fine when Bender gleefully declares “hamburgers!” (Trust me – it’s funny when you hear DiMaggio say it.) The first three movies felt a little like Futurama on automatic pilot, but this one has a lot more zip to it. The prior three flicks came with varying degrees of Important Messages. That remains true here, as Yonder spotlights environmental topics and sexism. Occasionally, those elements become a little heavy-handed, but the film maintains a good balance. Indeed, it’s able to have its cake and eat it too; while it promotes a positive message, it also mocks the excesses of the movements involved. And it’s darned funny as it does so. True humor largely went missing in the first three movies. Sure, they had their moments, but not enough really amusing ones. I chuckled occasionally but almost never laughed. That wasn’t the case with the often hilarious Yonder. “Hamburgers” is just the start, as it boasts many laugh out loud moments. The comedy keeps coming from start to finish, and even when they should get old – like the never-ending stream of feminist puns – they don’t. And maybe someday I’ll tire of West’s Nixon impression, but not today. I don’t think Yonder is just the best of the direct-to-video movies; it’s also probably among the best Futurama period. Even when it starts to get preachy, it’s just too clever and funny to fail. The film provides a consistent delight. 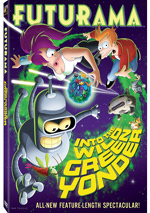 Futurama: Into the Wild Green Yonder appears in an aspect ratio of approximately 1.78:1 on this single-sided, double-layered DVD; the image has been enhanced for 16X9 televisions. I felt very satisfied with the visuals of the first three movies, and Yonder continued that trend. Should you expect this set’s extras to differ much from what we found on prior releases? Nope – they remain in line with the previous packages. We open with an audio commentary from creators/executive producers Matt Groening and David X. Cohen, co-executive producers Michael Rowe and Patric M. Verrone, producer Lee Supercinski, director Peter Avanzino and actors John DiMaggio and Maurice LaMarche. All of them sit together for this running, screen-specific chat. They discuss various story and character issues, animation specifics, references, and some acting choices. After many episodes of the series and three prior DVDs, this commentary stays in the familiar pattern. Cohen handles much of the basic data, with an emphasis on production trivia, while the actors add fun to the proceedings. Actually, this track focuses more strongly on actual information than in the past, largely because we get fewer actors; Billy West fails to reappear here, so some of the usual wildness goes out the window. In any case, the commentary offers enough information and amusement to be worth a listen. Next we find a 22-minute and 23-second Storyboard Animatic. This takes us through the first act of Yonder and lets us see the storyboards accompanied by dialogue and some music and effects. It’s a fun way to see the early stages of the film. A wacky behind the scenes piece comes to us with Docudramarama: How We Make Futurama So Good. In this five-minute and nine-second clip, we get an irreverent – and often incorrect – look at how they make Futurama. It’s a one-joke program that has a few laughs but gets old before too long. We take a visit with a guest star in the two-minute and eight-second ’Louder, Louder!’: The Acting Technique of Penn Jillette. He tells us that he can’t do any character voices other than his own and we watch him record some lines. And that’s about it – this doesn’t become a particularly interesting clip. Under Cutting Room Floor, we get a “treasury of deleted scenes”. In this case, “treasury” means five, and they run a total of two minutes, 51 seconds. These include “Dolomite Hill” (0:30), “Matcluck” (0:33), “Paint? !” (0:27), “Morbo Solo” (0:37) and “Mind Reading” (0:44). Obviously all of these are short, and most are extensions of existing scenes. Nothing stellar appears, but all the snippets are amusing. Matt Groening and David X. Cohen In Space! goes for four minutes, 24 seconds, as it shows the executive producers as they experience a “zero G” weightless plane ride. They narrate as we see images of their trek. This seems a little self-indulgent, but Groening and Cohen offer enough interesting details to make it worthwhile. Another featurette arrives with How to Draw Futurama in 10 Very Difficult Steps. Via this 11-minute and 10-second program, we find out how to sketch the Professor, Nibbler, Hypnotoad, and Fry. The artists give us some nice thoughts about their work in this fun piece. After this comes a four-minute and 19-second segment called 3D Models with Animator Discussion. Avanzino and director of computer graphics Scott Vanzo let us know how they created the elements for asteroids, the Feministas eco-van, the Giant Gorilla golf hole, the worm hole and the Nimbus. The guys tell us good notes about the images and throw in a few jokes along the way. A couple of wacky clips come next. We find Bender’s Movie Theater Etiquette (1:16) and Zapp Brannigan’s Guide to Making Love at a Woman (2:49). In the former, our favorite robot shows us how not to behave at the movies. In the latter, Zapp gives us his insights into wooing the ladies. Both are funny in theory but not so great in reality. Finally, we get at least one Easter egg. If you keep clicking around the wheel that shows the bonus features, you’ll hit the “1000” bar. Press “enter” to see a “toilet paper animation” of Bender (0:35). It’s pretty pointless. Futurama saves the best for last with Into the Wild Green Yonder. Apparently the final Futurama direct-to-video epic, Yonder avoids potential preachiness and entertains with many amusing elements. The DVD comes with the usual excellent picture quality as well as good audio and a decent array of supplements. After three disappointing Futurama movies, we finally get a very good one here.